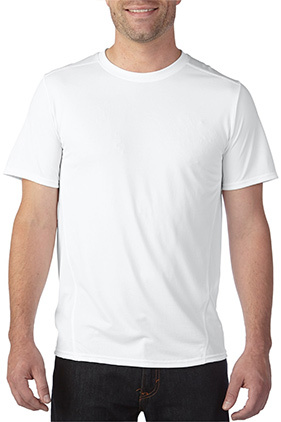 100% filament polyester, 4.7 ounce jersey knit performance t-shirt. UPF 30+ protection (UPF protection does not apply to the color white.) Moisture wicking and antimicrobial properties. Snag resistant. Forward flatlock stitched side seam. Rolled forward flatlock stitched shoulder. Seamed single-needle 3/4" collar. Contrast charcoal back neck tape. Pad printed neck label and double-satin shoulder label. Double-needle sleeve and bottom hems. Active fit.